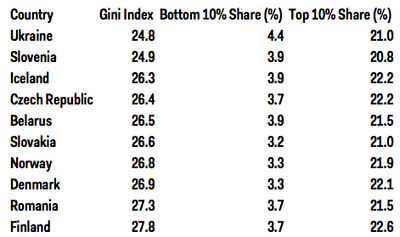 The World Bank has data on income inequality for most countries in the world. 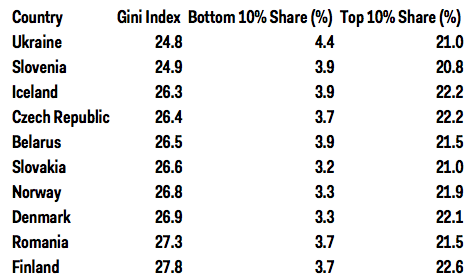 A common measure of inequality is the Gini Index, which describes how far away a country’s income distribution is from complete equality. In the World Bank data, the index ranges between 0 and 100: A country with a totally flat income distribution, in which every person received the same income, would have a Gini index of 0; a country with a completely unequal distribution, where one person got all of the income and everyone else earned nothing, would have an index of 100. 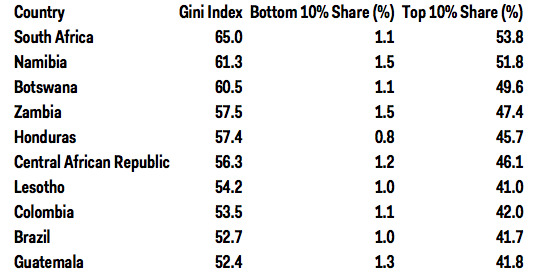 Most of the countries with the highest indexes, and thus the most inequality, were in Africa and Latin America. Eastern and Northern Europe were highly represented in the most equal countries at the other end of the spectrum. The US and China fell in the middle of the list. The World Bank’s estimate of the Gini Index for the US was 41.1, and China at 42.1, both slightly higher than the average among all countries of 38.8. The full World Bank data set, along with a number of other measures of income distribution and poverty, can be found here.